RIYADH, Saudi Arabia - One Saudi woman ignored the cancer growing in her breast because she didn't want to risk a referral to a male doctor. Another was divorced by her husband on the mere suspicion she had the disease, while a third was dragged away from a mammogram machine because the technicians were men. Breast cancer is still considered a taboo in oil-rich Arab Gulf countries like Saudi Arabia even as the disease claims more and more victims, but some women are pushing for greater openness about the illness. Their efforts received a boost this week: a visit from U.S. first lady Laura Bush to the region to raise awareness for breast cancer. This story really saddens me. 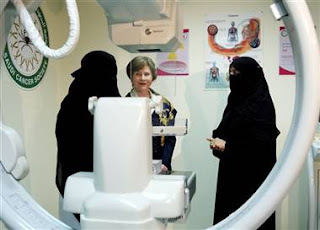 About 70% of breast cancer cases go unreported in Saudi Arabia until they are in the late stage. 30% of the patients are under 40 years old compared to only 5% in the US. The saddest thing about the whole thing is that everyone in Saudi Arabia has access to free health care and the country has the best medical equipment and doctors. It is hard to change the mindset of a deeply religious and conservative society. menyedihkan...ukai nyak berdosa kitai ngecheck kitai empu utk kesihatan..enda berasai mulut nyebut "so stupid!". besides,aku rasa,bala laki arab bisi ego mimit..sida iya aja betul and women are their slaves. Amat menyedihkan, nya lah pengarap sida ti ngasoh sida nya beli! Kati ko neju bini, tauka menyadi sakit udah nya mati? Penyakit ulih diubat enti tumu temu?